It was a misty morning for those driving from the northwest, at least until the Welsh border where blue skies welcomed the early starters for the opening ceremony of this season’s Border League inter-club competition held at Caernarfon. The start and finish were a short distance from the castle, a splendid backdrop for the first 4k alongside the estuary, with its shimmering silver speckles of autumn daylight on what was a very still day. 256 runners competed and completed the approx. 10km course, a flat start but with some undulations to take everyone just outside their comfort zone and equally take the pressure off it being a PB course. A fantastic showing once again by the six Helsby ladies, with Jayne and Jane superb for top ten finishes and Jane, Vanessa and Carol all on podium finishes for their age categories. This gave the newly promoted Helsby ladies team a brilliant 3rd overall which really helps to consolidate their position in the Division 1 right behind Chester Tri. It was a good result too for the men with a full complement of ten securing 4th position in Division two, which is probably one of our strongest showings for some time. Star performance once again goes to Albert Berry for securing pole position in his category. Many thanks to Mario who not only supported, helped with traffic management (on a busier course than expected with cars) but also sorted the numbers out at the end. Thanks also to Albert for printing and providing some great photos of everyone who was at the Sandstone Race a few weeks ago. Race 2 is Capenhurst, nearly on our doorstep so will be good to have a big field of Helsby for this race on Sunday 11th November at 11.00am. Remember it’s a roughly 10k course and flat and fast, free to enter, just need to wear the club vest. “I had cracking day out yesterday with Tony Wimbush (Idle AC, & the man behind the gofar ultra challenge website), running the Peak Six County Tops. We rationalised the original route that was done last December, which reduced the distance to 45 miles, & there’s about 6300 ft of climbing. 0:04 Cheeks Hill (Staffordshire). Not so much a hill, more a wall corner on a slope. Then the only main road stretch, 1.5 miles to the Cat & Fiddle, in the cloud. 0:44 Shining Tor (Cheshire East), & the cloud lifted. Paths & quiet roads now to Kinder, with the weather really rather good for running: no wind & the right temperature. We went via Errwood Reservor dam, Combs, Lower Crossings, New Smithy & Beet Farm (the High Peak 40 route) which worked pretty well, it’s all fast. Then along the fence line past Brown Knoll & up the Pennine Way to the Kinder Low trig. Luckily we had good visibility so only faffed around for a few minutes finding the official “top” (using back bearings on Kinder Low & the Wool Packs). SSE & we picked up the Edale Skyline shortcut to the head of Grindsbrook, & followed the edge path from there to Crookstone. On the way the heavens opened & we got 30 minutes of cold rain & sleet. That really wasn’t pleasant, considering we weren’t exactly equipped for winter conditions. Down to the Ladybower Reservoirs to warm up, then with the weather back as it was we climbed up the good track From Howden Dam to Howden Edge & started the awful boggy trudge. It’s really wet up there this weekend, & we were up to our knees many times. …and the swamp continued along the tops all the way to Featherbed Moss & down to the A628 Woodhead road. It’s not quite as bad over Dead Edge End and Britland Edge Hill, but we were getting pretty tired by this point & it took forever to reach Holme Moss. A steady trudge up Black Hill got even blacker & we had to don headtorches, but we were lucky enough to find the path up OK. It was a choice of fell, road or multi-terrain for the energetic and active Helsby brigade this weekend, so needless to say lots of results to give and some fantastic achievements in there too. Thanks to everyone providing me with information on what you have been up to as it really helps the searching and just to reiterate if I miss anyone’s results it’s usually because the runner isn’t down as Helsby so it’s always worth letting me know if that’s the case. And if seeing these results whets your appetite to ‘up’ your training then by all means head along to Castle Park nr Frodsham on Monday nights at 6.30pm to do a roughly half hour session of speed work with Joe and Mario. Head torches optional but can be useful! First session will start October 22nd. I’ll start with what is now a regular and popular occurrence in the Helsby calendar, the British Fell Relays, sporting such athletes as the World Orienteering Champion and most recent UK, British and English Fell Running Champions, who all knew they were in good company once they saw the Helsby hoodies turn-up. Similar to the event last year at Kettlewell, the nearly one thousand fell runners were treated to a gorgeous day of blue sky and fantastic scenery, a day that could almost have been part of our missing summer if it wasn’t for the welcoming frost and autumnal colours once reaching the destination early doors. The relays were organised by Mercia with all four legs starting and finishing in Church Stretton and utilising the beautiful and rugged and hilly terrain of the Shropshire hills. As far as I could tell things ran smoothly and everyone appeared to be enjoying the atmosphere and day, possibly either before or after their respective runs I should add, with the start and finish side-by-side giving all runners a chance to cheer on their comrades in arms at each leg handover. Many thanks go to Phil for organising and sorting the teams, arriving early to register and then to put up the Helsby gazebo in a prime location, close to tea and cake. 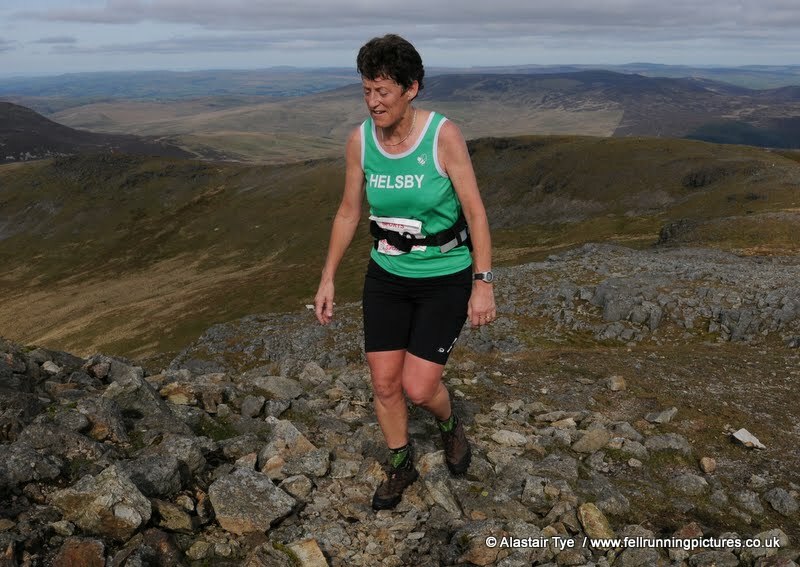 An earlier event in our fell calendar ‘Callow’ was a tough introduction but gave a good indication of what shoes to wear for the terrain and what the actual running would be like. A great way of seeing the area would be looking at the many photos already up on various websites including Alistair Tye’s here. More photos will follow from various websites so please keep checking back on the blog to stay updated as I’ll add them when I get to hear about them. Helsby had two teams out from the 151 teams that finished and quite possibly Helsby’ s best results yet, especially for the ladies. Jayne and Dave Feakes took the pressure leg, leg 1 where all the anticipation and excitement and energy is concentrated in the colourful array of club vests in the starter pen. A vocal crowd cheered the runners as they screeched past burning some good fell tread in the short road section early on before the real endeavour of hills took place. Jayne had a storming run for an 11th lady overall (against some serious competition) and Dave ran well on legs that were less than seven days after a marathon. We nurture some tough cookies at Helsby it seems. Jimmy and Adair had their work cut-out to try and catch Vanessa and Lesley who were enjoying the run of their lives getting to checkpoint 2 and almost 45 minutes into their run before pleasantries were able to be exchanged. It felt like leg 2 was tough, with a middle section leading everyone into a false sense of security before the final climbs, with hands on knees and sterling support from Joe and Mario forcing out the last of our commitment to hand over to the great team of Phil and Steve for the thinking man’s leg, the navigation. Vanessa and Lesley still smiling all the way in were able to hand over to Jane and Janet to embark on some hills with added route choice. Even with flags I don’t know where I’m going so well done to the two navigation teams whose times surely show some sublime ‘orienteering’ skills. Andy and Nesta were on the anchor leg, I believe leg 1 in reverse, and after waiting round and supporting everyone else taking photos and eating fantastic homemade flapjacks both securing great times to put the two teams not too far apart. Helsby men achieving a 102nd place in accumulative time of 5.05.56 and Helsby ladies toe to toe nearly all the way with 123rd and 5.32.08. Hopefully we can continue our good progress next year in October when the 2013 relays will be announced. I don’t need to write much about this marathon as Ivan has written a fantastic race report below. Ivan led the green vest home. Full results can be found at the following link but I’ve extracted out Helsby runners. Well done for all your runs and excellent work by Tom DeJong in his first marathon and all runners were easily in the top half of the field. The Liverpool marathon and run Wirral 10k both started from Birkenhead park, with the 10k following the same route before peeling off just after New Brighton. It was extremely tempting to make that sharp left turn at 6.2 miles as it turns out the medals were identical to those doing the full marathon! After leaving the park the runners headed off towards New Brighton and up almost as far as Hoylake before turning around and running back along the front towards Birkenhead again. Basically a half marathon on the Wirral and then another half in Liverpool itself. To coin a phrase ‘ it was definately a game of two halfs’, as the first 13m were very flat and the second half not so…The runners then crossed into Liverpool via the Queensway tunnel, which for anyone who’s ran it in the 10k event they hold, has a cruel incline halfway. The start of this uphill was almost at the 13mile point and lasted for approximately 2 miles. From this point onwards the main thing that sticks in my mind is just how much of the second half was uphill!! We exited the tunnel to lots of cheering and huge crowds but the road was still definitely going up until about 15 miles when we headed towards Liverpool one and up a very very cruel hill past the Anglican cathedral to mile 18. The next 10k or so was all in Sefton park before at last some downhill back past the cathedral and towards the finish by the Liverpool museum. A great race with superb support and great organisation, although I’m not sure that it’s for those after a pb. I was slightly downbeat by my time of 3.27 which put me in 313th out of about 5000 and 59th in age cat. I stayed for the presentations and was surprised to see not a single lady finished under 3 hours. Perhaps those hills got to the elite athletes too..
Just uploaded a video and some photos of the Helsby gang in action at the Fell Relays. Please find Helsby double IronMan Dave Madders latest race report. Never one to take an easy option Dave was…. 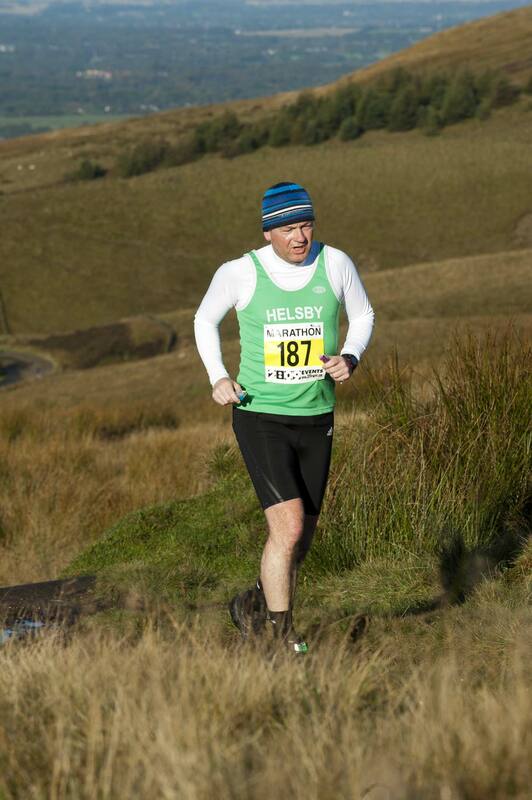 “the only Helsby member there but still donned the green vest for the Rivington fell marathon on Saturday 6th October. Described as ‘trail’ I pictured Delamere-esque terrain and thought it would be a good training run but oh Jesus it wasn’t like that at all! Starting at Rivington nr Bolton the first 9 miles included 2 ascents of Rivington Pike and an ascent of winter hill all off road and in places in shin deep mud! …then a further ascent of Rivington Pike before it flattened out onto trails until mile 15 where I waved goodbye to the flat again and ascended Angelzark Moor before yet more trails and ridiculously muddy fields, arriving back at Rivington, Bolton after 26.2 miles. Fantastic effort Dave and you did the club more than proud. More good news: the good folk at Triactive are offering 10% discount off regular prices to club members. Remember you can also get 10% discount at Up and Running on Bridge Street too. I know online shopping is often attractive, but it’s always nice to support real life shops too, and you can’t beat personal service with something like shoes. Well done to Albert and Carol who were both 2nd on the night. Albert was getting better throughout each event and ended up a brilliant 3rd in his category for the four races. Carol Shaw is also showing off her blazing form gaining a 2nd place trophy for the series. Jackie was 3rd in the same category so shows how strong the Helsby ladies are at the moment. Well done to everyone taking part. I’d recommend this series for anyone who likes trail running or with a competitive spirit for the club, but there is probably no better advert than the following link created and sent by Jackie with the photographs courtesy of Bill who has been out supporting at the races. Helsby had five runners out for the ‘A’ and eight for the ‘B’. Another tremendous by Carol who ran in 1st in her category which ensured her a quality and substantial looking trophy, not a bad week for Carol! Jayne Joy’s first attempt at the Sandstone trail and another fantastic run saw her pick up a trophy for 2nd lady and a brilliant 15th overall.